WordPoints provides points hooks to automatically award points for certain user actions. But sometimes you may find a need to manually change a user’s points. This can be done on the user’s profile. 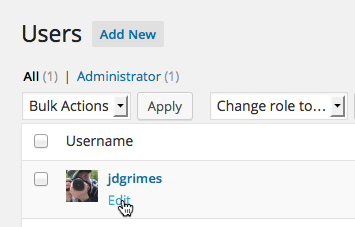 To get to the profile of the user, you can go to the Users administration panel, and search for the user. First, navigate to the Users administration screen. Next, click on the user whose points you want to edit. Edit the user’s points under the “WordPoints” heading.